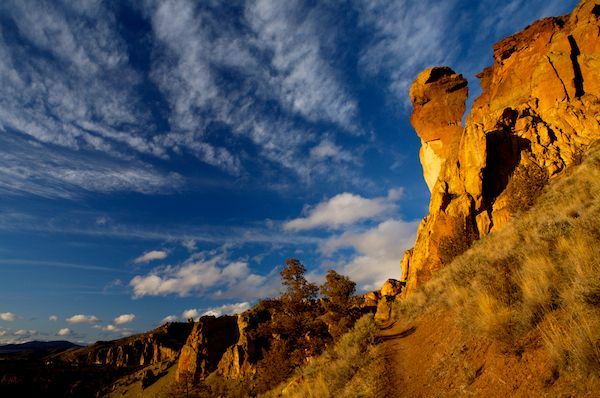 One of the classic hiking areas in Central Oregon lies high on the flanks of Central Oregon’s Broken Top Mountain. This gorgeous area is largely composed of high dry alpine basins peppered with mountain streams, waterfalls and wildflowers. 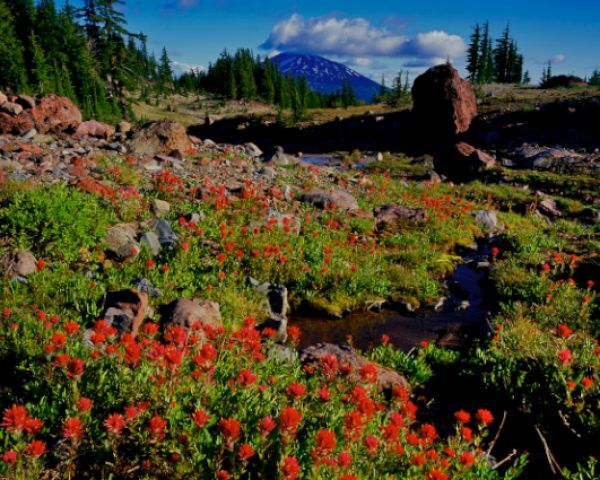 It is a stunning place with easy access to high alpine getaways that Central Oregonians crave during the heat of summer. 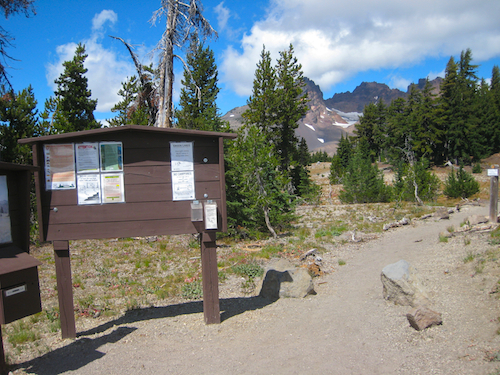 The Broken Top Trail head is accessible from the Cascade Lakes Highway near Mt. Bachelor. The beautiful photo seen below was provided by the good folks at Pacific Crest Stock Photography. 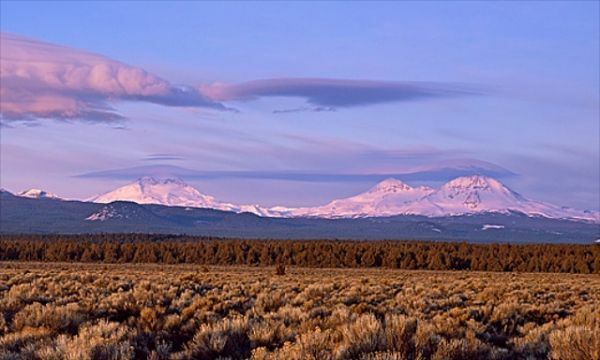 Visit the following link if you’d like to see more top quality photos of Broken Top and the Three Sisters Wilderness area. From Bend, head south on Century Drive towards Mt. Bachelor. Continue past Mt. Bachelor and turn right on forest service road 370 which is also the turn off to Todd Lake. 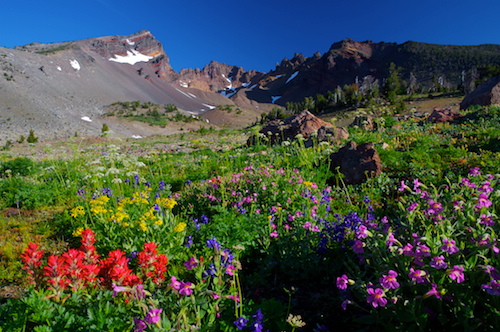 For some beautiful photos of Todd Lake, Sparks Lake and Elk Lake, visit the following link. 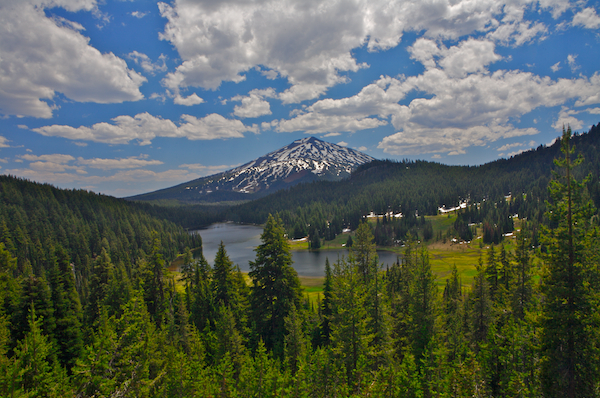 Cascade Lakes Highway photos, including, Todd Lake, Sparks Lake, and Elk Lake Photos. 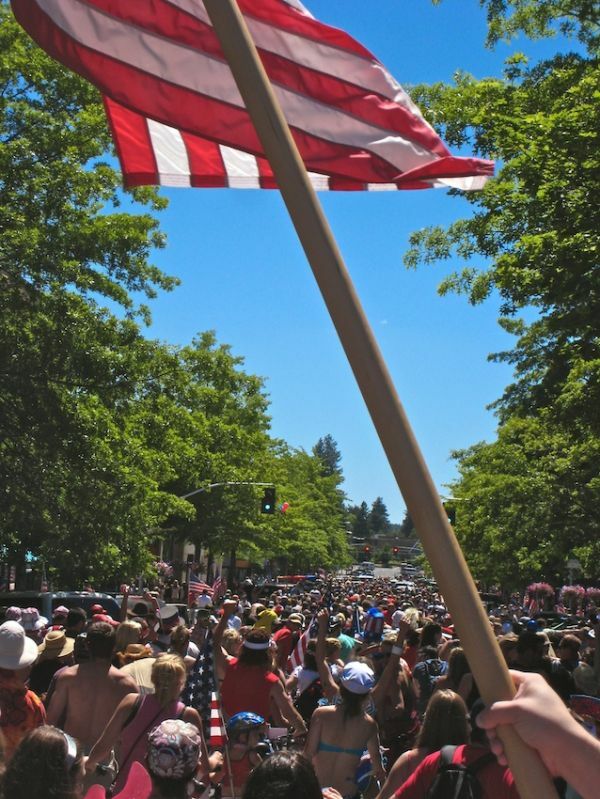 The link will give you a good idea of what the Cascade Lakes Highway has to offer. After about one half mile, you’ll reach the Todd Lake parking area and the Todd Lake trail leads off to your left. The above photo is of Todd Lake. Yeah it’s pretty but keep going past Todd Lake for even more stunning alpine scenery. While Todd Lake wasn’t my destination in this adventure, it does offer some beautiful scenery. Visit Mike Putnam Photography for a stunning photo of Todd Lake. Instead of stopping at the Todd Lake parking lot, continue upward on the 370 road. This road is often opened late in the summer because snow keeps it closed and our forest service is underfunded. Regardless of the time of year, this road is not for passenger cars. It’s not so much a traction issue as it is one of clearance. My wife’s subaru outback can make the trip so you can gauge the road based on that. Don’t plan on being in a hurry, especially if it is midday in August as there will certainly be other cars slowing you down on this one lane forest service road. The total drive time from the Todd Lake Trail Head to the Broken Top Trail head is about 25 minutes. 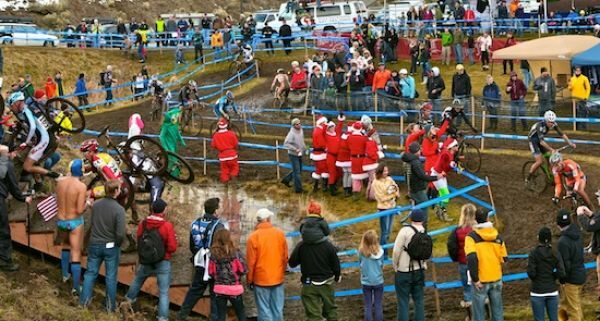 Much faster than this and you are risking a broken axle. Continue upward on the rutted, rocky, narrow and dusty 370 road for about 20 minutes until you reach the 380 road where you will turn left towards the Trail Head. 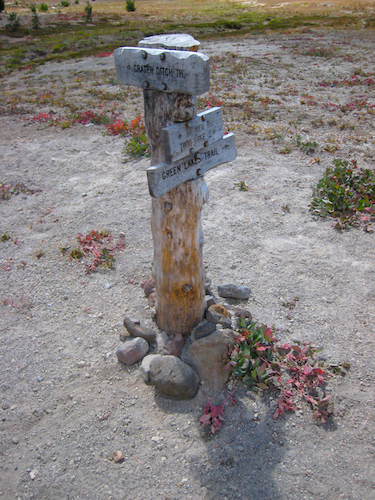 There is a sign pointing towards the trail head but it appears to have a short life expectancy, so don’t count on it being there in the future. The 380 road is just as rugged as the 370. After about 5 minutes of bumping and grinding the gears, you’ll dead end at the Broken Top Trail parking lot. If you get there in the middle of the day on an August weekend, the parking lot may very well be full, so come early or late or not at all to avoid frustrations. The views from the parking lot are a great start to a wondrous hike. Below is the view from the trail head with Broken Top seen in the distance. 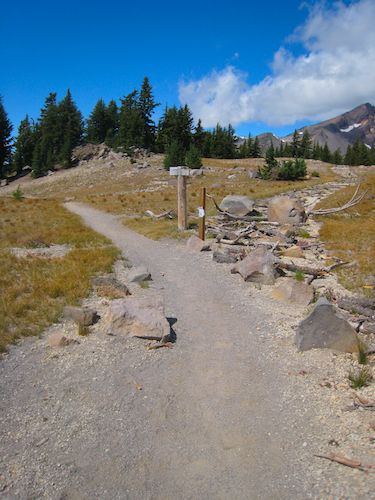 Broken Top Trail head as seen in the Deschutes National Forest of Central Oregon. The trail is obvious here as it is in most areas of this hike. Soft, pumice padding lines this dusty but very scenic route. After about 1/4 mile you’ll reach the abandoned/closed trail seen below. Supress you urge to be naughty and instead stay to the left. I’m sure there is some reason that the forest service doesn’t want you using the old trail to the right, so don’t! From here the trail meanders along a level grade until it reaches an important fork in the trail which is seen below. The route to No-Name Lake and its glacier filled waters goes to the right at this junction and the trail to Broken Top’s Craters goes to the left at this point. You’ll notice a sign along the left fork that is barely visible in this photo which signals the beginning of the beloved Three Sisters Wilderness. For the purpose of this trail guide, we’ll take the fork to the left first and as part of a later entry we’ll visit the No Name Lake basin. Staying to the left, the trail gently ambles downward through some very impressive Old Growth Mountain Hemlock stands seen below. 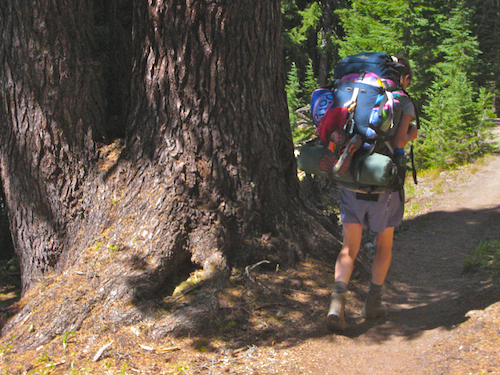 Skinny legs and a big Old Growth Mountain Hemlock along the Broken Top Trail in the Three Sisters Wilderness. The trail continues downward to a gentle stream crossing pictured below. From this stream crossing the trail continues downward towards the Crater ditch which it crosses. 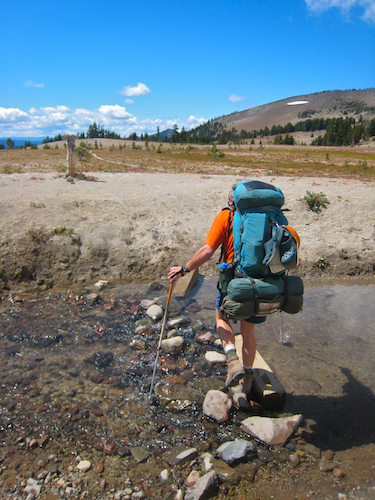 A hiker is seen crossing the crater ditch below. This stream crossing can be difficult if water levels are high but I’ve never seen them to be dangerous. On the opposite side of the stream/ditch is the direction sign pictured below. Wilderness direction sign along the Broken Top Trail in Central Oregon. 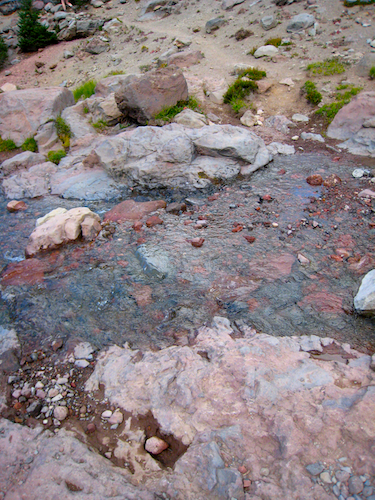 The trail to Broken Top’s Crater goes to the right after crossing the stream. 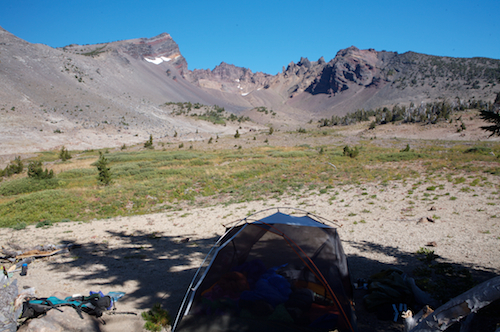 Strangely, there are no signs pointing to Broken Top’s Crater, although it is quite obvious if weather is cooperative. 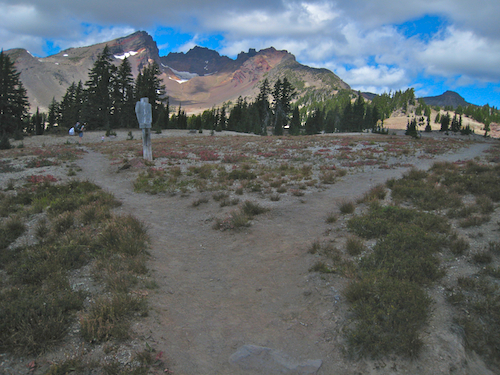 The Crater Ditch Trail Head is to the left from this point and the connector trail to the Green Lakes Basin is straight ahead. 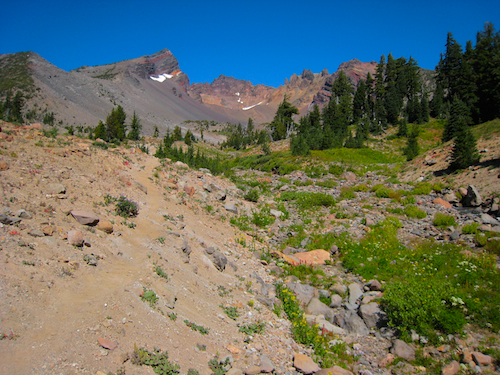 After turning right, the trail gradually begins to climb up into Broken Top’s Craters. There is no obligatory turn around point along this trail. Stamina, fitness or time will likely be the deciding factors along this trail. I would highly recommend continuing upward as far as possible as the terrain grows more spectacular each step along the way. 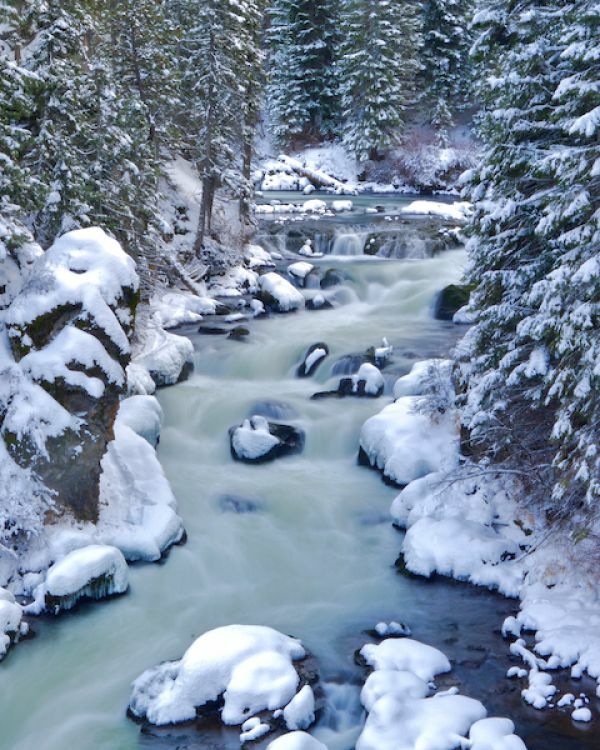 …..the snow takes til late summer to melt because the Forest Service is underfunded?? Scotty, Thanks for visiting. I intended to note that the road is often closed late in the season be cause of snow cover And the forest service is underfunded. I have been up the road many times when the snow gate was still closed for the season and there was no snow all the way up to the Broken Top Trail Parking lot. This leads me to believe that there is a funding problem. Sorry for the confusion.